Americans are renowned for their high expectations when it comes to customer service. The success or failure of a restaurant can be heavily affected by the quality of its service as well as the food it serves. As such, many eateries emphasize the importance of providing guests with a superior dining experience through excellent service. People in the U.S. can be quite demanding when it comes to eating out. Oftentimes, they will expect to be served promptly, so students working in restaurants should be comfortable with keeping track of several tables of guests simultaneously. Diners will also want to be treated with courtesy and respect, so it is important for work and travel program participants to have a warm and friendly demeanor if they are serving customers. If students are responsible for taking orders while working in U.S. restaurants, they may find that multitasking skills are particularly useful. American restaurant menus, whether in fast-food or sit-down settings, can be extensive, and some diners will have large and complex orders. 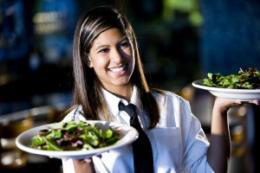 It is common for patrons to substitute menu items, whether out of personal preference or special dietary requirements, so people working in restaurants should be attentive and detail-oriented. This is especially important when dealing with dishes that contain ingredients that diners are allergic to. Tipping is customary in U.S. restaurants. In fact, according to Michael Lynn at the Cornell University School of Hotel Administration, tips make up a significant portion of servers' take-home pay. Some diners will tip generously for exceptional service, so students should pay attention to diners' needs and make an effort to provide them with the best possible service. It is also common for restaurant staff to inquire whether customers are satisfied with their meal once it has been served. This interaction provides patrons with the opportunity to request additional items or raise any concerns they have about the quality of the food. Tips between 15 and 20 percent of the bill's total are standard at most establishments. Dining out is a common part of daily life, and visitors working in a U.S. restaurant can be assured of an exciting and challenging experience. Seeing how Americans interact during meal times also provides insights into U.S. culture that may not be seen in other environments.